Exquisite 1950s-inspired design, set in a modest 38mm case; the perfect size to gently modernize a vintage-inspired design. High-arched sapphire crystal with anti-reflective coating. Swiss Made – featuring the Swiss Sellita SW215-1 Elaboré movement with bespoke color-matched date wheel. Ultra-Slim at just 9.65mm including apex of crystal. 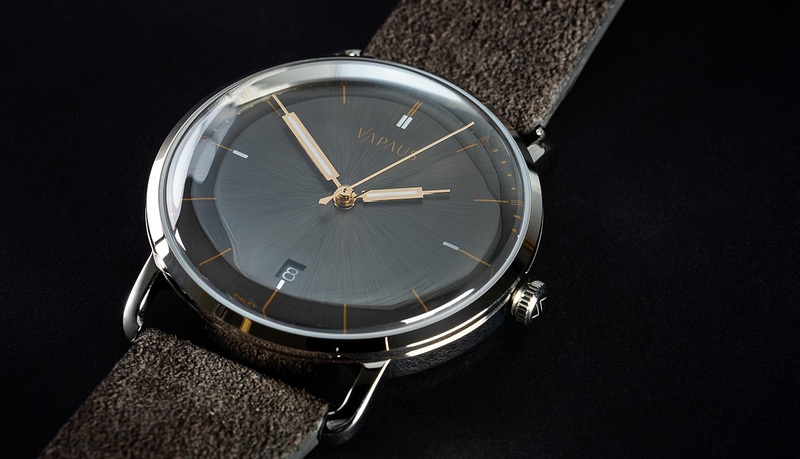 The Veli was produced in a limited run of just 260 pieces, which sold out quickly. 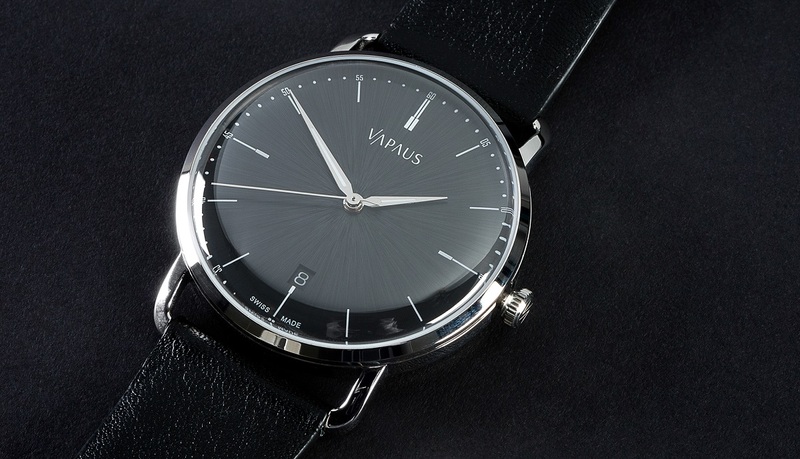 Vapaus recently opened the doors for the second production run. The pre-order requires a 50% deposit and will be delivered in November, with free worldwide express shipping. 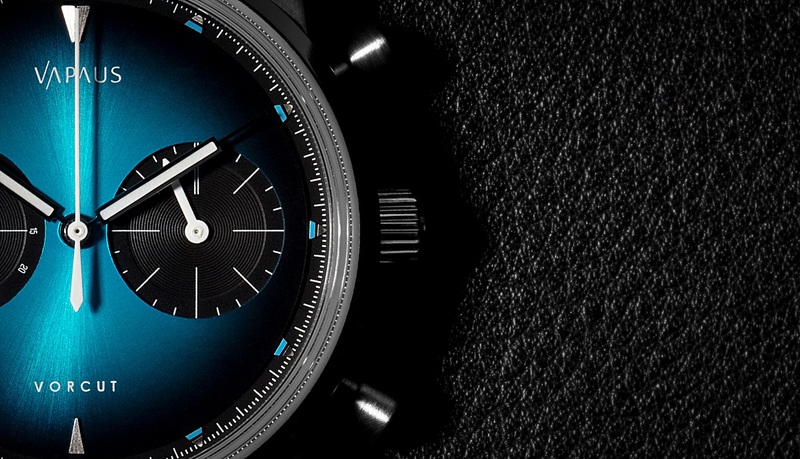 The Veli (priced at £699) is offered in four sunburst dials: Deep Blue, Slate Grey, Ice Silver, and Space Black with a choice of either classic alpha hands or the brand’s signature syringe hands. 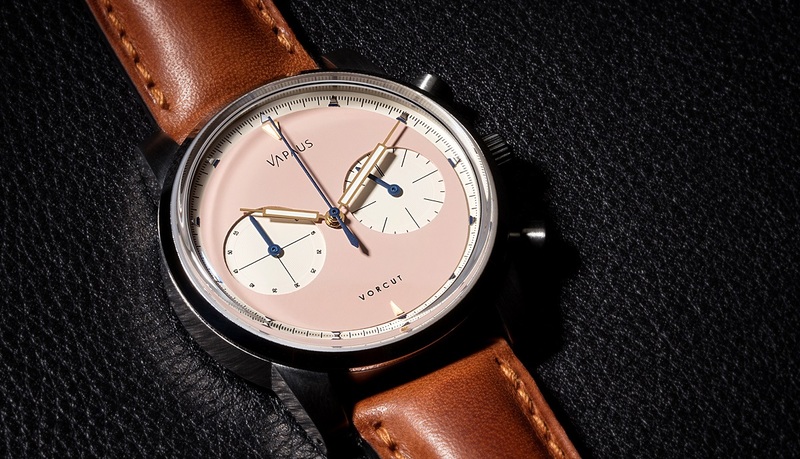 The brand’s newest watch known as the Vorcut is a 38mm chronograph currently live on Kickstarter, where it is priced with an attractive Kickstarter discount at £275 (RRP £365). 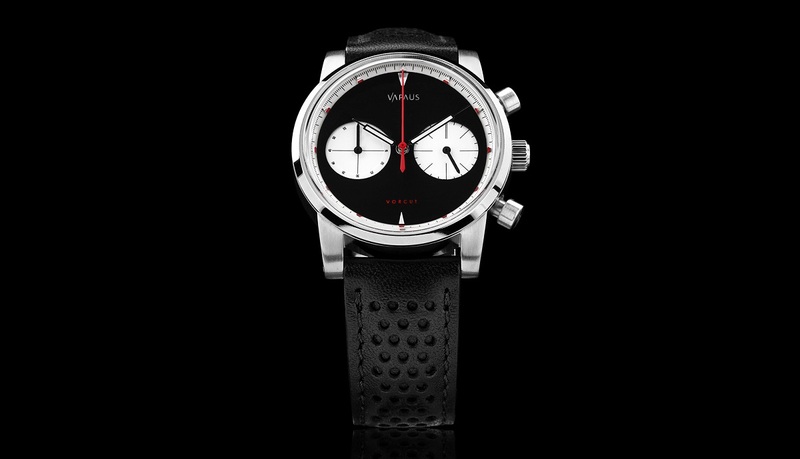 Inspired by the iconic chronographs of the past, the Vorcut collection ranges from the dark, brooding dials of the Atomic and Midnight, to the effortless cool of the Duke, to classic Panda dials. During the development process, Vapaus reviewed every mechanical chronograph movement on the market, including the ETA Valjoux 7753, Sellita SW500, Eterna Caliber 39, Seiko NE88, Dubois Depraz module fitted to either an ETA 2894-2, 2824-2 or Sellita SW200 or SW300, and the Sea-Gull ST19-1. Summarizing these movement deliberations, Oliver states: “To us, slim meant ~10mm case depth, excluding the box sapphire. We could not get close to this using any of the above listed movements. The ST19-1, being hand-wound, gets closest, but we were put off by mixed reports of its mechanical reliability. All the other options left us looking at a total case depth in excess of 16mm. Given our firm commitment to a 38mm, this was simply not acceptable. We did make a case prototype, and the case depth was daunting, and very unattractive. In the end, the VK64 was the perfect solution for us. We achieved a case depth of 9.55mm, the watch wears beautifully, and the movement handles very nicely – the pushers have a solid, mechanical feel, and the chrono seconds hand snaps back into place crisply. In the Veli and the Vorcut, Vapaus have created a harmonious pairing. 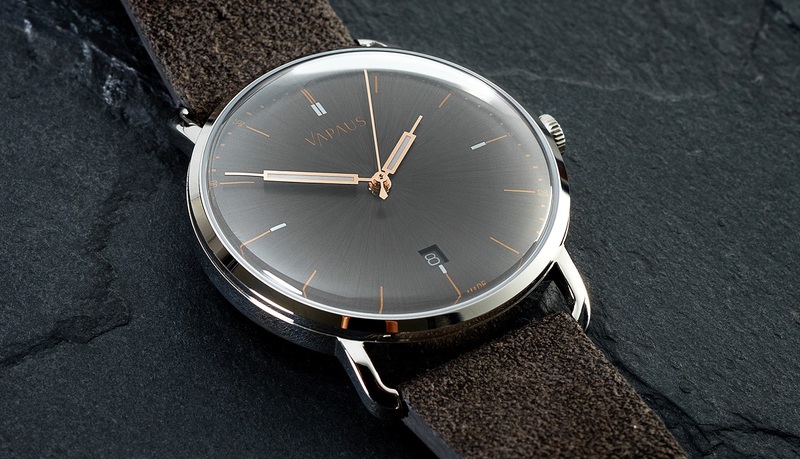 The Veli, a casual dress watch in essence, is the working weekday watch. 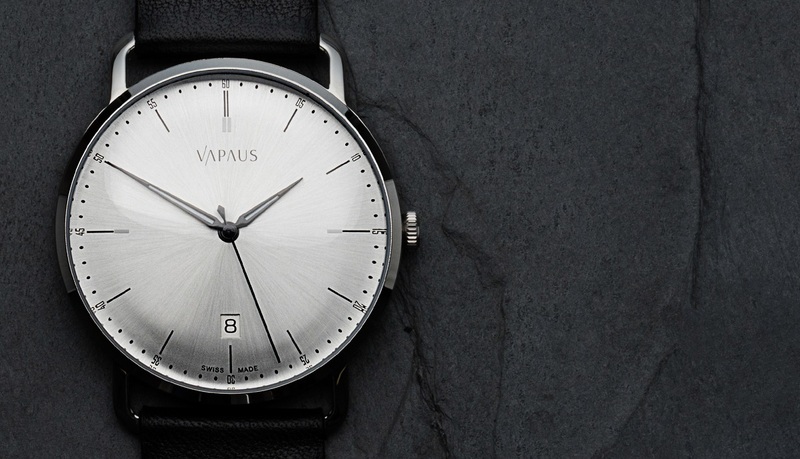 Come the weekend, the slim, sporty Vorcut can expect to see more wrist time. 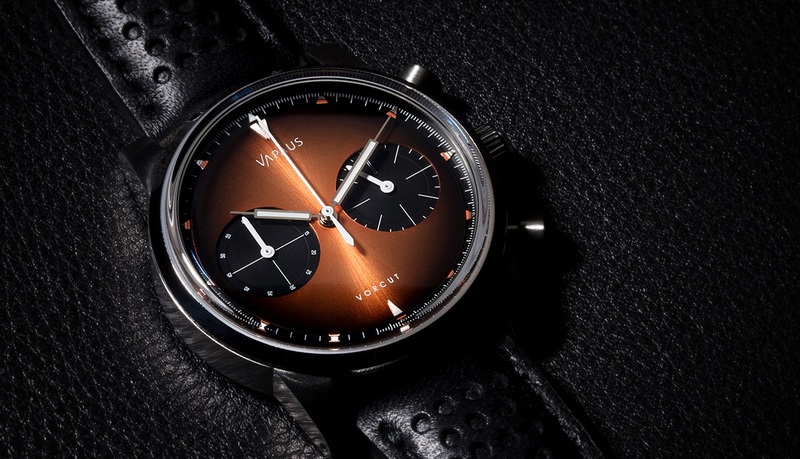 I much prefer your plain dials, rather than squeezing a chronograph into a 38mm case ( Who really uses a chronograph anyway? ). The colours are lovely and quite distinctive but i think you need to work on the hands. I don’t like the look of syringe hands on any dial, big horrible clumpy things, especially on such a small dial. The leaf hands are always quite elegant ….but verging on boring. A chance to really stand out among the crowd is to have a distinctive hand, possibly a along the lines of a spade hand. Hi Raymond, thanks so much for your constructive comment. I’m really pleased that you like the dial colours. 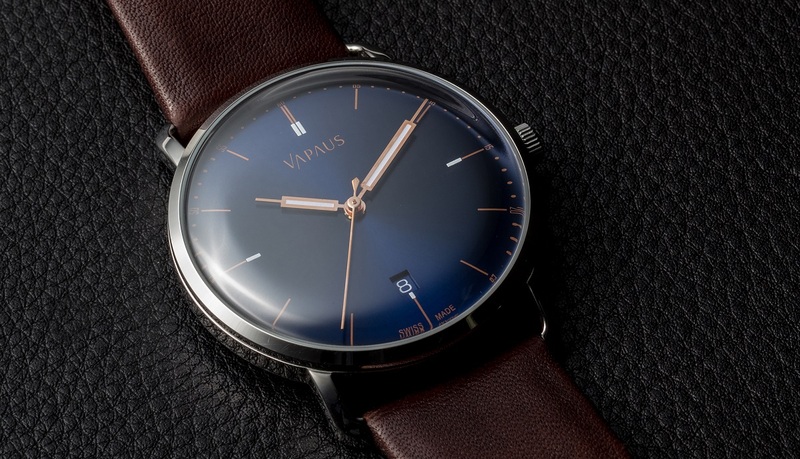 For the Veli (the dress watch), the Deep Blue and Slate Grey dials have been the most popular, whereas for the Vorcut, it seems the Duke (teal degrade) and Atomic (amber degrade) are the favourites. The syringe hands are certainly controversial! My brother and I love the juxtaposition between the dress sunburst dial and angular almost clunky hands (which is in-keeping with our fascination with retro-futuristic design), but understand they are not to everyone’s tastes, so we offer the simpler / more trasitional alpha hands on the 1950 model. I do find myself wearing the 1950 Ice Silver a lot, as it has a timeless elegance (albeit it could be accused of being boring). 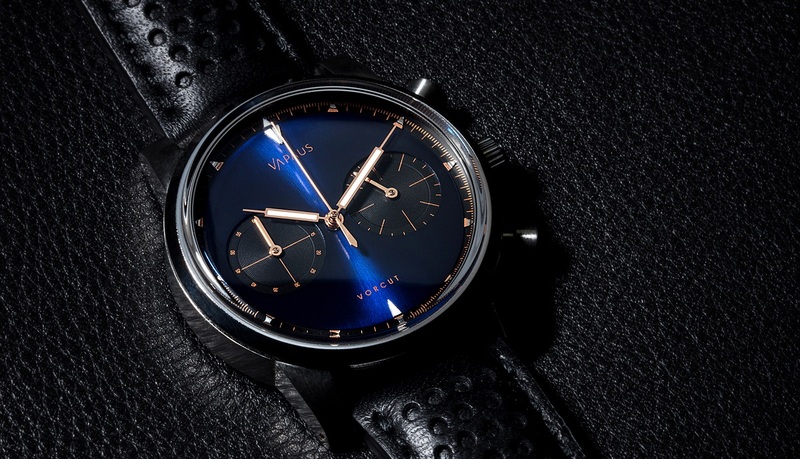 I like the chronograph, especially the array of colors but 38mm is a tad small as far I’m concerned. 40mm would’ve been nice. They have a Undone Mystique/Baltic Bicompax chrono minimal vibe to them. It’s a sharp look. Your comment about the ST19 movement was interesting. I have no personal experience with it but have read and heard it performs fairly well and is pretty robust. I know it’s used in the Baltic but like I said I can’t speak to its durability. The mecha-quartz is a good compromise between cost and quasi-mechanical performance. I happen to have a chrono with the ST 19 (no issues with it BTW) and it’s also a 38 mm watch. I like the look of these from Vapaus more, but I wish they were slightly larger. 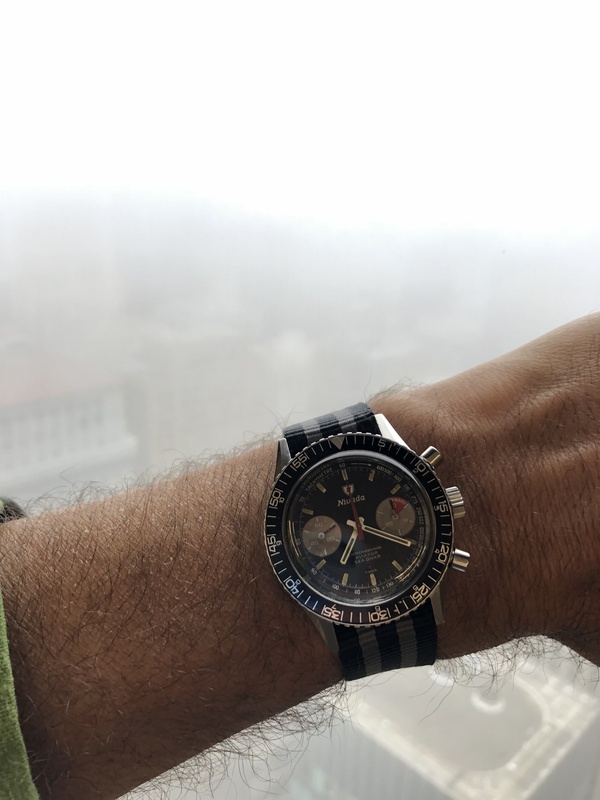 One of the things that gets in the way of my enjoyment of my 38mm chrono is its small size – for a chrono. Perhaps these would wear larger since they’re not so thick. Indeed, my Hamilton intramatic, at 38mm, feels perfectly sized (maybe because it’s very dressy and/or due to its thinness). Does only the chrono seconds hand sweep, or does the sub seconds hand also sweep smoothly? I’ve never had a watch with this movement. The chrono hand sweeps while the sub seconds hands ticks ala quartz. Thanks. That’s good to know. It would help to see these in person to know whether they looked good on me/to me, but isn’t that always the case (the Atomic is quite a nice color combination in the photos)? As for their three-handers, they’re attractive but at this price point there are some other options – though not many with that beautiful box sapphire (one is the Chr. Ward C65 Vintage). I have a genuine Seagull with it. It’s not a great movement. Engagement of the horizontal clutch is terrible. Erratic and twitchy. Timing is just ok at ~ +20s/day. Movement looks really nice at arm’s length, but up close the finish is poor. Very over-rated on an absolute scale, great on a “new-watch-with-column-wheel-per-dollar” scale. A lot of people singing the praises of it don’t have any other good Chronograph experience to reference. Thanks for sharing your experience with it. Interesting, egznyc below has one and no problems. Seems to be indicative of Chinese watches and movements, not a lot of quality control so it’s hit or miss what you get. Thanks for sharing this. It very accurately summarises the concerns that we have about the movement. I do believe they produce some good movements (hence reports of solid performance), but I fear that the quality and QC is erratic, which was simply not a risk we wanted to take. Really vibing with that salmon dial. I’m glad you like it! It was an idea generated in our private Facebook group (Vapaus Watch Club). It has proved to be a surprise hit (although it certainly divides opinion!). Salmon dials are rarely done well, and the ones that are done well are extra-costly. I really like this variation, and it’s cost effective. The blue dial and gilt syringe hands is a handsome look, quite nice. A variant with a copper or champagne dial and blued syringe hands would be interesting. If anyone starts a petition against silly watch companies names, let me know please. “Veli” means “brother” in Finnish. How do people pronounce these names anyway? [vah-pows] and [vel-ee] are approximately correct pronounciations, but I’m sure real life will give some more imaginative results. Greetings from Estonia. I also understand Finnish. Unfortunately there’s zero explanation about the name. Maybe vapaus together with veli is supposed to relate with forestbrothers who fought for freedom? The naming of the company is tied into my relationship with my brother. I founded the company with Rudi who is a composer (www.rudiarapahoe.com). In 2011 he worked on an art installation called ‘Contraction’ with the Danish artist Martin Thaulow. The installation was initially based on the beautiful island of Bornholm in the Baltic sea, but later traveled to Copenhagen. He had a wonderful adventure in Denmark, meeting Thaulow’s family, friends, other artists and musicians. Travel is so good for the soul. This later translated into Rudi and I travelling together to a different location in the Nordic region each year; few plans, two weeks, minimal luggage… We experience such a sense of freedom on our travels together. It’s hard to put into words, but it is like this time stayed with us when we returned to the UK, both in the way that we made decisions in the present, and how we planned for the future. In naming the brand we wanted a term that encapsulated this sensation and our adventures together in Europe. That’s a really beautiful piece! Yep that’s a beauty – love the shape of the red seconds hand on that piece. Elegant dials (almost Undone-like?) and cases, and appreciate the álpha’ hands, but sorry, your syringe hands don’t work for me at all, and pity the date window is lost from your chrono. Thank you! The syringe hands are divisive or as we say in the UK ‘Marmite’ (you either love or hate them)! I think these are superb. Love the hands and salmon dial. Great to see you’ve dumped the date window. People are snooty about quartz, but I generally prefer high-quality quartz over cheap and unreliable low-quality mechanical. Thanks! 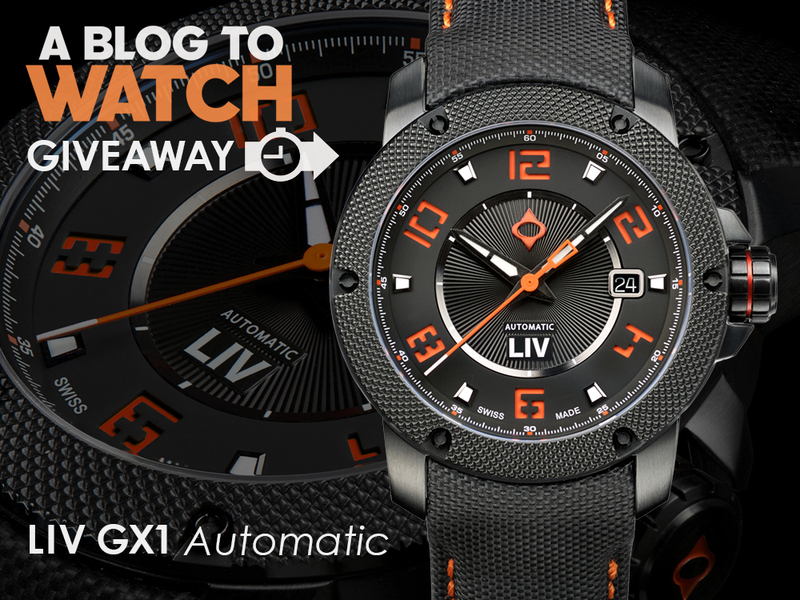 The Salmon dial almost did not make the cut to the final six colour-ways, though Oliver fought for it. I’m glad he did, it feels very retro in the metal. 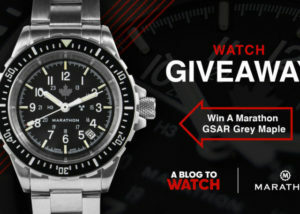 I’ll be the first to admit, as a watch lover that I can also be a little snooty over quartz! We deliberated (and 3D rendered) long and hard over losing the box sapphire and making a thicker watch, but it simply did not work — and there was no way that we could part with the box sapphire! Beautiful, simple, and stylish. Plenty of choice, and modest prices. It’s not hard to get a watch right, as long as it retains the basic elements that satisfy a potential buyer. This range has those elements, yet manufacturers at double or triple the price get this wrong constantly.